How Diatomaceous Earth Works to Help Your Health. 1st: As you can see from the picture of Diatomaceous Earth - (magnified 7000 times) - it looks like a cylinder full of holes--kind of like Rice Chex Cereal. This cylinder has a very strong negative charge. As these millions of cylinders move through the stomach and digestive tract, they attract and absorb fungi, protozoa, viruses, endotoxins, pesticides and drug residues, E-Coli, and heavy metals. These are trapped inside the cylinder and passed out of the body. In addition, any larger parasites that happen to be in the stomach or digestive tract are "cut up" and killed by the sharp edges of the Diatomaceous Earth. All of these activities result in a much healthier body with less sickness. We often hear the phrase "I just feel better" with our Diatomaceous Earth users. This better feeling comes from all the "junk" being removed from the body and by giving the immune system the "jump start" it needs. Healthier Colon. This is especially important as we get older. A clean healthy colon keeps away polyps, cancers, and ulcers. Today, many are spending thousands of dollars to get colonics to do the same thing as Diatomaceous Earth does. Many users report increased energy and needing less sleep. This is a result of all the food and nutrients that are taken in being better absorbed into the blood stream. With a coated colon--many nutrients never get absorbed. 3rd: A small amount of Diatomaceous Earth gets absorbed into the blood stream as silica. One of the benefits of Silica is that it helps to destroy bad fats. Everyone that we know that is taking Diatomaceous Earth has lowered their cholesterol by 40-50 points. Everyone is also amazed at how their high blood pressure goes down. Go to the page on "Human Use" and review all of the benefits of silica to the body. The benefits of silica are many. In today's grains, there is actually a shortage of silica. Years ago, the silica found in our foodstuffs was adequate, but with today's hybrids and depleted soils, only about 1/3 of the silica needed is supplied in our food. Diatomaceous Earth is a simple and inexpensive way to get the silica your body needs. 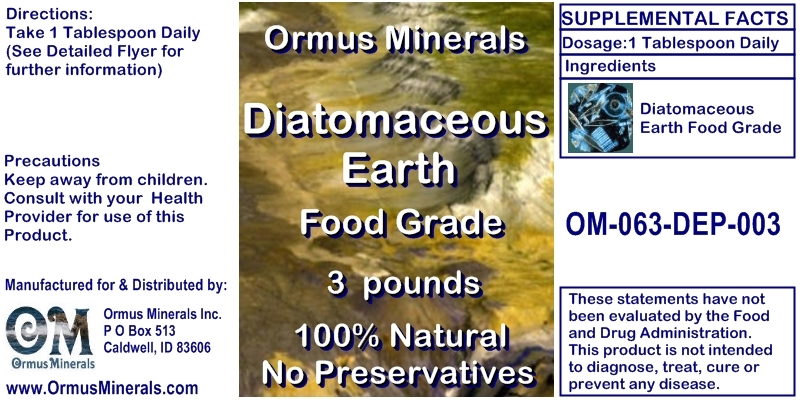 Content on this site is for reference purposes only, based on reviews from users of diatomaceous earth. It is not intended to substitute for advice given by a physician, pharmacist, or other licensed healthcare professional. User statements regarding this dietary supplement have not been evaluated by the Food and Drug Administration and are not intended to diagnose, treat, cure, or prevent any disease or health condition. Those with health problems, pregnancy or who are nursing are specifically advised that they should consult their physician before taking any nutritional supplement. Any food grade diatomaceous earth uses other than those approved by the EPA, FDA, or USDA are strictly reports of what hundreds of users as well as we ourselves have done with diatomaceous earth.